WASHINGTON, DC -- Despite what Vladimir Putin is saying, the United States still staunchly refuses to believe Russia is engaged in a new Cold War — and that the U.S. is losing. Vladimir Putin has used the fighting in both countries to trap the U.S. But Russia aggressively pushes its own narrative where U.S. leadership is absent. Russian Foreign Minister Sergei Lavrov seems to be everywhere in recent weeks, speaking several times with his US counterpart and others in the region, selling Russia as a partner for peace and stability when the West is faced with crisis. Experts from the left and right alike warn that cooperation with Russia on Syria can have potentially disastrous consequences for the U.S., but too many Americans still don’t understand how closely linked these two headline conflicts are, and American policy has yet to confront the reality that Syria and Ukraine are part of the same mission for Russia — the destruction of the post-WWII architecture of the West. To achieve this goal, Russia has pursued a clear policy of disruption, chaos and destabilization — in Ukraine and in the Middle East — in order to force the West to have to partner with Russia to “resolve” the crises it has created. Now, poised to launch a direct military campaign in Syria, Russia wants the U.S. to join a Russian-led coalition against the Islamic State and complete the rehabilitation of Bashar al Assad, or else end up in direct conflict with Russia in the Middle East. Indeed, many of the anti-aircraft and other Russian weapons systems being moved to Syria are more suited to shooting at American drones and assets than anything the Islamic State has access to. This suggested coalition is little more than a well-constructed trap for the White House and for Europe. Russia created the conflict in Ukraine. Their military support for Assad fuels a bloody civil war and a refugee crisis from Syria. Russian efforts have also materially aided in the creation of the Islamic State — the wealthiest, best-armed terrorist network in history. Understanding how Russia has engineered the false choice between accepting Russia as a dominant force in its “sphere of influence” or the proliferation of conflict is essential to accepting that neither choice is the answer. Too often policy analysts debate whether the Kremlin is strategic or merely tactical in its approach to foreign policy. But the answer doesn’t matter. They don’t need a master plan when one clear strategic objective drives decision-making: make the U.S. the enemy — and make them look weak. The Kremlin has been opportunistic and decisive in grabbing a position of strength — in the Middle East and in Europe — while U.S. attention has waned and retracted. When the civil uprising against Assad first began in Syria, the rebellion’s leaders hoped for western support. Support for the rebels was slow to materialize, despite early calls for Assad to leave power, but Russia — eager to protect its military foothold on the Mediterranean and on the southern flank of NATO — was quick to line up against U.S. policy and supply Assad with arms, military advisers, intelligence and political support. After Syria deployed chemical weapons against rebels and civilians in August 2013, Russia brokered a deal with the U.S. to save Assad from outside military intervention. Russian support for Assad has allowed the civil war to continue for years at such an intense level of bloodshed and destruction. But shipments of armaments were not their only tool for saving their primary regional ally. They are also involved in building an engine of terrorism to open a second front in the Syrian war. By the time the chemical weapons deal was signed, the nature of the war in Syria had changed. Before the 2014 Sochi Olympics — as Russia issued warnings about potential attacks by North Caucasus extremists and moved military assets into the region for the seizure of Crimea—there were rumors, now confirmed by Russian investigative journalists, that Russia was actively exporting fighters from the North Caucasus to Syria. Elena Milashina, writing in Novaya Gazeta, documented how, beginning in 2011, the FSB established safe routes for militants in the North Caucasus to reach Syria via Turkey. Local FSB officers, sometimes with the help of local intermediaries and community leaders, encouraged and aided jihadis to leave Russia for the fighting in the Middle East, in many cases providing documents that allowed them to travel. Go fight in the desert, for infinite riches and glory, or stay in Russia, where the security services had pretty good cover to kill a lot of them. A lot of them left. In late 2012, Russian-speaking jihadis began to arrive in Syria. According to regional intelligence sources who have closely tracked their movements and activities, the Russian-speakers negotiated the unification of the Islamic States in Syria and in Iraq, creating the current Islamic State formation. Suddenly, the war in Syria was “confusing” to American policymakers seeking a way out of the war and an end to Assad’s regime. There were “good rebels” and “bad rebels,” and the U.S. couldn’t decide which side to support. These tactics were similar to the irregular warfare Russia would deploy in Ukraine. The war at that point also turned away from Assad and Syria, and toward Iraq instead. The western front of ISIL was led by Russian-speakers; the eastern commanders included disenfranchised Soviet/Russian-trained Saddam-era Sunni military officers. From the beginning, their efforts were closely coordinated. There were reports from Kurdish forces of Russian operatives at secret outposts in the desert. Meanwhile, back in Russia, the jihad in the North Caucasus was steadily depleted. Crimea was seized and annexed in 2014. Russia’s information war portrays Assad as a champion against terrorism, with the help of Russian and Iranian support. This Middle Eastern narrative is a key instrument for distracting attention from the war in Ukraine. The war in the Donbass has grown quiet, and will likely stay that way until Putin makes his first speech before the UN General Assembly in 10 years on September 28. This is a part of his strategy to strong-arm the Obama White House into supporting Russia’s actions in Syria. Putin will speak about Ukraine and the war on terror — while Russian deployments to Syria escalate, with many of the same shadow special forces units launch from Sevastopol to Damascus. Syrian refugees flood Europe and create political crisis. Many European leaders have stated that Russia must be part of the solution in Syria — despite the chaos it’s purposefully creating in Ukraine. This is, of course, exactly what Russia wants. A global expansion of the “reset:” partner with Russia to solve the crises it has created while ignoring its bad deeds. 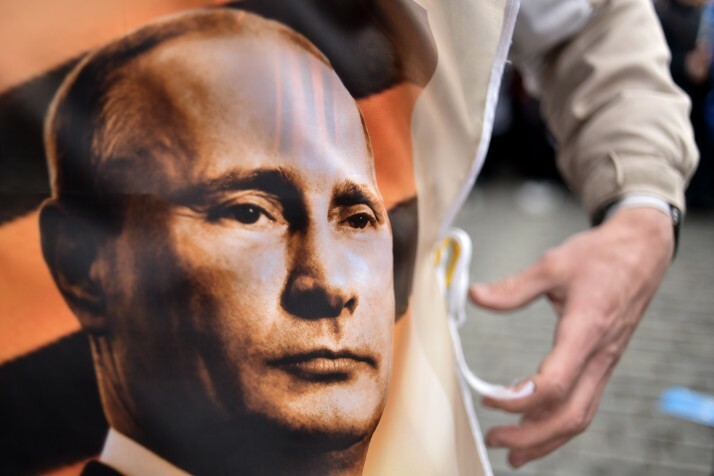 Russia’s strategy has included the empowerment of other bad-news actors. Russia has pushed for the U.S. nuclear deal with Shiite Iran; Russia will also benefit from the deal commercially and financial and in terms of the strengthened positioned for its ally in the region. Russia has simultaneously used the dissatisfaction of regional Sunni powers to cultivate relationships with traditional American allies: increasing economic, nuclear and military cooperation with Egypt; negotiating a nuclear deal with Jordan; coordinating energy policy with the Saudis. Russia now pushes for an anti-terrorism coalition to complete the rehabilitation of Assad, undermine the U.S. position on Syria, likely force an end to the sanctions imposed because of its actions in Ukraine and position Russia as a regional leader. As a bonus, Vladimir Putin could erase another despised democratic revolt by ending the Syrian people’s desire for freedom. In Moscow’s eyes, this is victory over the U.S. Both in Ukraine and in Syria, Russia created chaos to become the center of all U.S. policy options in the Middle East and Europe — or so it would have the U.S. believe. Absent real leadership on U.S. foreign policy, the Kremlin has been successful at manipulating what they view as an indecisive and disinterested U.S. president into caving to their demands. In the Kremlin’s best case scenario, the U.S. and Russia become allies, killing Chechen jihadis and re-entrenching Assad, and they receive new concessions to bolster their efforts to destabilize the government in Kiev. With their bluster and threats, they encourage the White House to see the alternative as pursuing separate policies over Syria and ISIL and possibly end up in direct conflict — a Vietnam for the post-Cold War era. It is the outcome Putin has craved since the war in Georgia in 2008 — forcing the U.S. to back down from direct confrontation, empowering the Russian exceptionalist narrative that he so hauntingly outlined when he called for the annexation of Crimea. After slow half-measures in response to two conflicts fueled by Russian money and military support, Putin feels certain that Obama will not risk even a proxy military confrontation with Moscow. And with one year left in the U.S. presidency, he sees now as the time to act. Cultivating an engine of terrorism to save Assad and distract from Ukraine is a dangerous game — but Russia’s risk/reward calculus is far different from ours. Russia doesn’t need to challenge NATO’s Article 5 collective defense principal if it can neutralize the United States. This will impact the outcome in Ukraine and across the frontier of Europe, put frontline nations in the Baltics at further risk and determine the future of NATO. U.S. policy has failed to develop effective responses to end the conflicts in Ukraine and Syria or slow the expansion of ISIL, and now many nations are at risk. The next U.S. president will likely come to office facing a world in which U.S. interests are challenged and compromised, and in which the architecture of Western security is at risk. Without the alliance structures we have relied on to provide peace and stability since World War II, it will be more costly and dangerous for the United States to defend itself and its interests. But the current U.S. president can still act to ensure the world is not adrift to the manipulations of an alliance of tyrants. Russia has constructed a dangerous geopolitical trap for U.S. policy. The way out requires the U.S. to develop adequate policy positions and stop equivocating about what Russia is doing in Ukraine and Syria. This policy must also be enforced, instead of revised and retreated from each time Russia manufactures a new opportunity to bully us. Provide Ukraine defensive arms and intelligence support; re-engage the Middle East and stop apologizing for Iraq; and confront Russian actions in the region and beyond. The answer to the crises in Ukraine and Syria, and the refugee crisis and the blossoming threat of ISIL, is in facing the centrality of Russia’s role in these conflicts and taking the lead [which Obama will never do]. I support the advise given in this article "Provide Ukraine defensive arms and intelligence support; re-engage the Middle East and stop apologizing for Iraq; and confront Russian actions in the region and beyond." to our impotent President Mr.Obama.